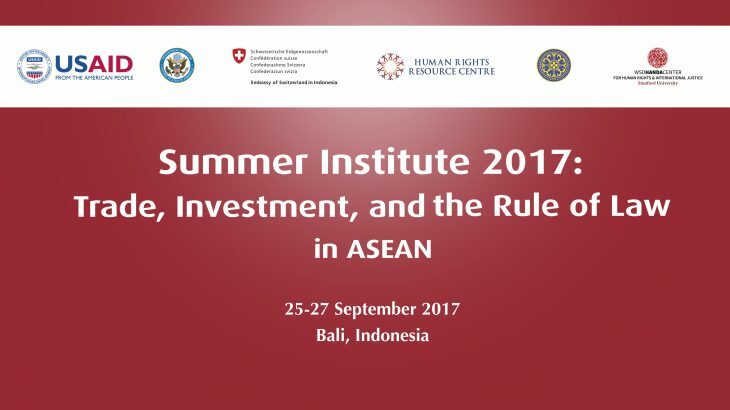 This is to announce the postponement of the 2017 Summer Institute in International Humanitarian Law and Human Rights (Summer Institute 2017) on the theme “Trade, Investment, and the Rule of Law in ASEAN” scheduled on 25-27 September 2017 in Bali, Indonesia. We have been closely monitoring the status of Bali’s Mt. Agung volcano since Indonesian authorities have raised its alert levels. This was raised to level 4 on Friday night, 22 September, the highest alert level with warning that an eruption is imminent. An area within the 9 km radius of the crater have been declared a no-go zone and locals have already been ordered evacuated (and up to 12 km in the N, SE, and SW portions) and continuous tremors have been detected over the weekend. With this situation, the organisers believe that placing the safety and well-being of its participants must be foremost in our considerations. We do not want to place participants in danger in the event of such an eruption and we also want to avoid the risk of participants stranded in Bali in case an airport closure is ordered. Thus, we have reached the difficult decision to postpone Summer Institute 2017, which we will reschedule as soon as possible. The organisers regret any inconvenience this development may cause and we are grateful for the kind understanding of all involved as we face this exigency that is beyond our control. We will post notice of the new event date as soon as the same is finalised. ACMW, ACWC, AEC, AICHR, ASEAN, Business & Human Rights, News, Rule of Law Mt. Agung, Postponement. permalink.